"I love using stickers to make cards because they're so easy to incorporate. 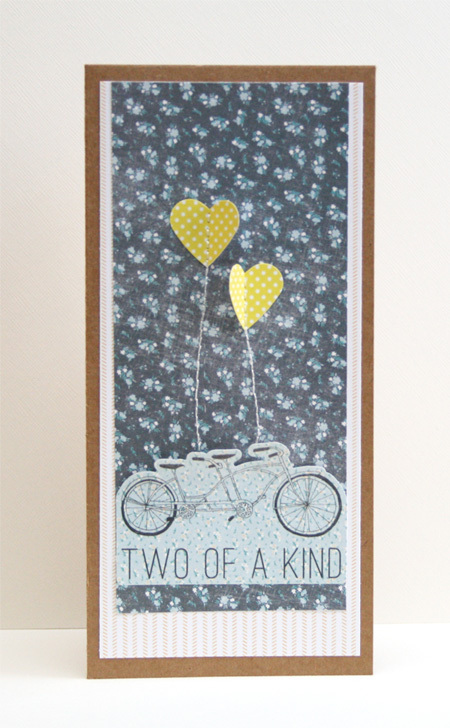 Using the 'Two of a Kind' bicycle sticker from the Vanilla Sunshine collection as the starting point, I built around it with the darker floral pattern paper as it's main background. I then sewed on two hearts as balloons tied to the bicycle. One of my favorite contrasting techniques is to use a bright punch of color in an unexpected way incorporated into the card to really brighten a dark background - here as heart balloons." Too cute! Love that bicycle stamp, and the fussy cutting! I just love the heart balloons!